An exploration of Lake Erie North Shore & Pelee Island can start in Windsor where you can try your luck at Caesars Windsor casino or enjoy a more refined visit to the Art Gallery of Windsor. From the big city, you'll want to take country roads to Leamington, Kingsville and Ruthven, which are all short driving distances to Point Pelee National Park. Ferry access to the common way to get to Pelee Island where it's suggested that you walk or bike around the island and tour the Pelee Island Winery and sample their wines from May to October. Rondeau Provincial Park, which is about 45 minutes south of Chatham, is a crescent-shaped sandspit with dunes, hardy grasses and marshlands which allow for herons, bitterns and rails to nest. There is a forest of beech, sassafras, sugar maple, shagbark hickory and tulip trees. Port Stanley is a scenic port town with a great nautical and train travel history. 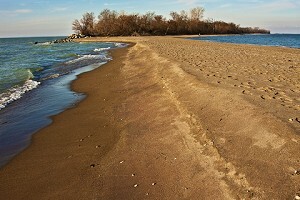 Accommodations servicing Lake Erie North Shore & Pelee Island include hotels, motels, resorts, bed and breakfasts and campgrounds. We are located off Highway 401 near Wheels Inn Wild Zone Adventures, the Chatham Cultural Centre, the Chatham-Kent Museum, Kinsmen Auditorium, St. Clair College, Thames Campus, the William Erickson Arena and Buxton National Historic Site & Museum. For a fun-filled vacation, book your room at our Chatham hotel near Uncle Tom's Cabin. Conveniently located near Highway 401, our hotel offers free parking so you can easily visit popular local attractions. Start your day with free Bear Bites continental breakfast with hot items before checking email with free Wi-Fi Internet access. All of the rooms are pet-friendly. Our turn of the century Chatham hotel has been transformed into a modern luxury boutique hotel with 45 individually styled guest rooms. Complimentary amenities include WiFi, bottle of water, long distance calling to North America, use of GoodLife Fitness and Shakti Yoga and 18 Holes of Golf at Willow Ridge Golf Course in Blenheim (seasonal). Our clean, comfortable, quiet rooms are serviced daily and include the following features to ensure a comfortable stay in this Chatham hotel. Queen-Size Bed Rooms and Family Rooms, Cable TV, Microwave, Fridge, Free Local Calls, High Speed Internet and free parking. This Chatham motel has been providing travellers and visitors with superior hospitality. Whether you’re travelling for business or pleasure, you’ll find many great reasons to stay with us. We have all the modern amenities you need to enjoy your visit: you can conduct business and catch up on the day’s events via free Wi-Fi or relax and watch a movie on one of our flat-screen TVs all in one stay! This Hotel in Chatham includes both a Business Center and Fitness Center for more convenience. The indoor pool is a great place to relax after using free Wi-Fi access to catch up on email. Located right next door to the new Chatham Kent John D. Bradley convention Center. Free breakfast. This Chatham hotel offers a seasonal outdoor pool and rooms with refrigerators. Microwaves and free Wi-Fi are standard at all rooms. The rooms also feature bath products and a wake-up service from the front desk. The hotel provides a daily continental breakfast. After a meal guests can relax on the terrace or explore Chatham. Located off Freeway 401 in Ridgetown, this hotel offers an on-site restaurant, an indoor pool, and free Wi-Fi. Each traditional guest room is furnished with a refrigerator, microwave, and coffee maker. Cable TV with 10 movie channels is provided. A continental breakfast is served every morning. Our Kingsville inn has three distinctive suites on the second floor of the original 1880 Kingsville Homestead. Guests are surrounded with all of the comforts of today's modern amenities while being charmed by the time-honoured ambiance inherent in this brilliant property. The property is also home to Jack's Gastropub, Banded Goose Brewing Co & Blackjack Gastrovan. This Kingsville Inn has four custom designed rooms, each with its own theme. Each suite is equipped with a ceiling fan, a flat screen TV with cable, a Blue Ray player, and movies. Each room has a private en suite bathroom. This Hotel in Kingville offers free WiFi. Every room at this hotel is air conditioned and is fitted with a TV. The rooms have a private bathroom. Extras include bathrobes and free toiletries. This House in Kingsville provides elegant, comfortable guest accommodations for short or longer term visits. Features 5 spacious private ensuite guestrooms with wifi, separate areas for meeting or visiting, and a morning news/coffee room. Ample free parking and is a smoke and pet free environment. This Bed and Breakfast in Kingville offers two large, comfortable bedrooms - each with private bath. Along with King or Queen-size bed, they both provide a sitting area, cable TV, a desk with wireless internet, fridge and air-conditioned comfort. The great room is ideal for rest, reading, or breakfast. This Bed and Breakfast in Port Dover offers a barbecue and sun terrace. Guests can enjoy the on-site bar. Free WiFi, parking and bicycles are available. Welcome to this Bed and Breakfast in Port Dover. Open year round for the evening, a long weekend or for business travel. Forget driving and just park your vehicle in the driveway and it's a short stroll to the shops, restaurants and beach.